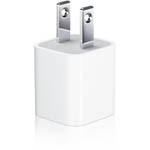 Apple has issued a recall for the iPhone 3G AC adaptors in a number of countries. It effects every iPhone 3G sold in the United States, Canada, Japan, Mexico and several Latin American countries. We are aware that this does not include any of official iPhone 3G devices sold in Saudi Arabia. But we don’t have an official iPhone 3G release here until now and many gray market iPhone 3G devices are already being sold here and if your iPhone 3G is from one of these countries then you need to get it replaced as soon as possible.